With lots of New Year Resolutions floating around, I wonder if any have resolved to dig deeper into the bible this year. Do you set out with good intentions to read the Bible but get bogged down in the language, such as “he begot this person and that person begot that person” for an example? I know I have really tried to set my mind to exploring and understanding the bible, but the verbiage gets me at times. But there’s more to the Bible, and that is where this book comes in! I was actually surprised how this book broke things down. For example, we all know that the Bible consists of the Old Testament and the New Testament. We probably all were taught in Sunday School that there are 66 total books of the Bible. Maybe you even had to recite the books of the Bible like I had to growing up. 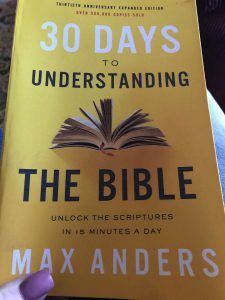 Well, this book takes it further in exploring the Old Testament, which goes from creation, through the life of Jewish people, and right on up to the time of Christ. There are 39 books of the Bible in the Old Testament, with 28 authors writing over a span of two thousand years. Did you know that? I didn’t! Further, the New Testament tells of the birth of Jesus, His life and ministry, and the ministry of His disciples that was carried on after His crucifixion. There are 27 books of the Bible in the New Testament, with nine authors writing over a span of less than one hundred years. This book goes a step further in explaining the Old Testament, with 17 historical, five poetical, and 17 prophetical books of the Bible. Likewise, the New Testament is broken down into five historical, 13 Pauline Epistles to the churches, and nine General Epistles. You don’t have to try to absorb ALL of the bible in one sitting. That’s virtually impossible. Even if you could read it all in a day, you wouldn’t be able to comprehend it all. With the aid of this book, however, you will gain more insight and understanding with just taking 15 minutes a day to devote to this cause. Further, they have fill in the blank areas within the book so you can jog your memory on what you just learned as you go along. This is done in an effort for you to retain the material later. As I held this book in my hands, the first person I thought of was my father. Through the years, his faith has really been tested and tried. He’s gone from being a firm believer, to being on shaky ground after losing his oldest daughter so tragically. Finally, after years of us praying over him, my dad was able to come to terms with his anger over the loss of his precious daughter and turn back to God. In doing so, he tried to dive into the Bible to gain further understanding and comfort with the Word of God. He began praying heartfelt, almost preacher-worthy prayers, which surprised us but comforted us at the same time. This was the Godly man my heart knew, loved, and remembered from my childhood. He has returned! Many thanks to Propeller Consulting, LLC for providing this book for my review.